Perfect in caprese, delightful on sandwiches, dazzling in salsa and lovely in gazpacho, tomatoes can be used in so many ways. Oh, tomatoes. How do we love thee? This nightshade originally hails from South America but has been cultivated in North America since before European explorers arrived, according to “The New Food Lover’s Companion” by Sharon Tyler Herbst. And although the U.S. government classifies it as a vegetable for trade purposes, it’s actually a fruit available in dozens of varieties. Tomatoes have been called by a variety of names over the years. “The Story of Food,” published by DK earlier this year, tells me that in the 16th century, Italians called them “pomo d’oro,” or golden apple. In southern France, they were called “pomme d’amour,” or love apple. Tomato comes from the Spanish word tomate and is believed to be adapted from an Aztec or Nahuatl word. Although you may be most familiar with the red tomatoes sold in grocery stores, they come in a variety of hues, shapes and sizes. Some of my favorites are the green zebra, a striped green tomato with a slight tartness to it, and the yellow pear tomato, a small pear-shaped variety that is a wonderful, sweet and juicy snack. Whatever you call them (I am partial to pomme d’amour), tomatoes are typically in season in Maine between late August and October, though sometimes you can find them sooner or later than that. 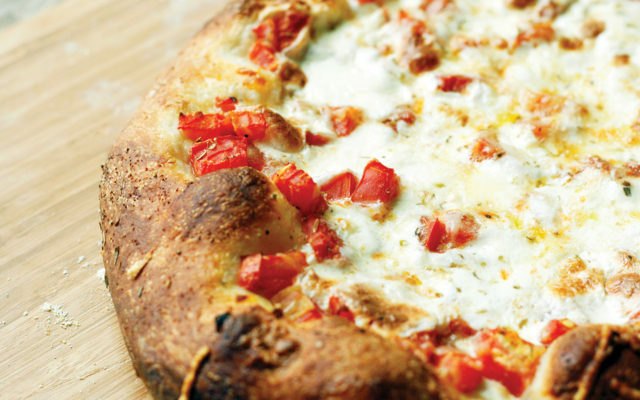 When you do find fresh tomatoes, try them on this pizza. Best made with the season’s freshest tomatoes, it’s topped with two cheeses and a bit of oregano in addition to the tomatoes. Simple, elegant and a wonderful use of this beloved fruit — or vegetable, if you prefer. Preheat a pizza stone in an oven set to 500 degrees Fahrenheit for 25 minutes. Meanwhile, dust the dough with flour and prepare a surface (a cutting board or pizza paddle) to work. I usually dust the surface with cornmeal but flour works, too. Work the dough into a round disk — about 15 inches in diameter. Place on the prepared surface. Stab the dough all over with the fork, and then brush with olive oil. Sprinkle the dough with salt, pepper and garlic powder. Spread the tomatoes all over the prepared dough. Top with mozzarella and then parmesan. Sprinkle with oregano, as desired. Transfer the pizza to the hot pizza stone. Bake for 12 to 16 minutes, or until golden. Remove the pizza from the oven and let cool for 10 minutes before cutting with a pizza cutter.